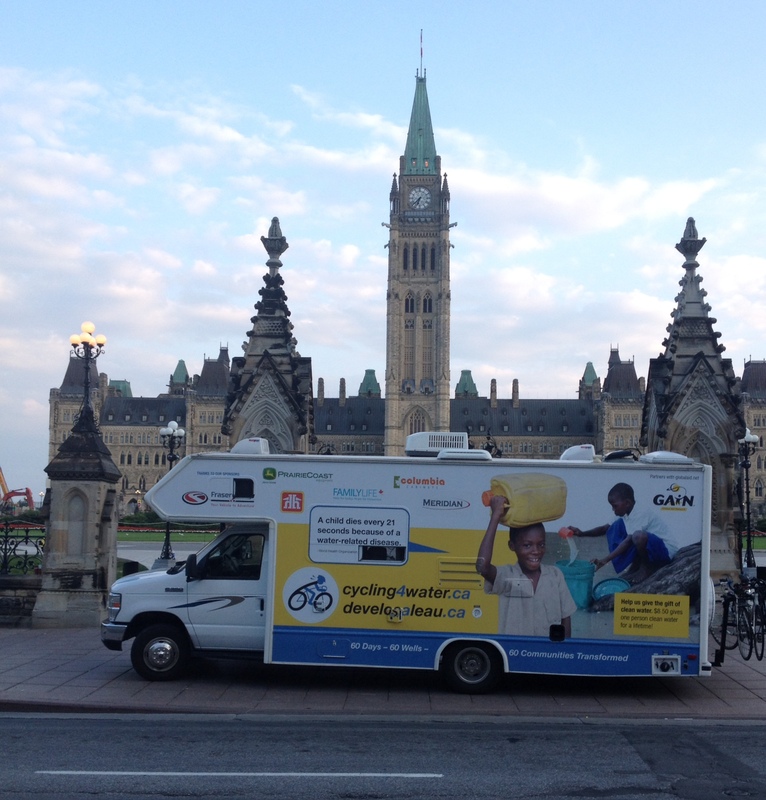 We were parked in front of Parliament Peace Tower at 6:30 am. 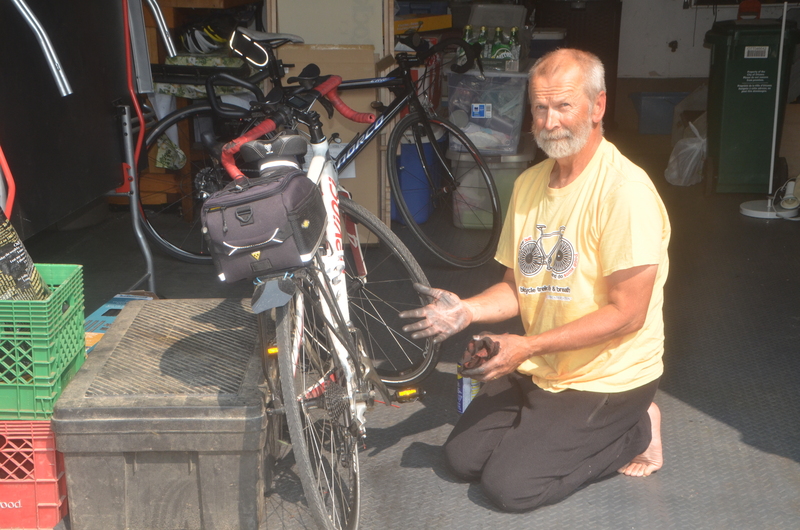 Harold and Darlene Albrecht MP Kitchner/Conestoga meet us to send us on our way. We spent about 30 minutes taking pictures to capture the moment. 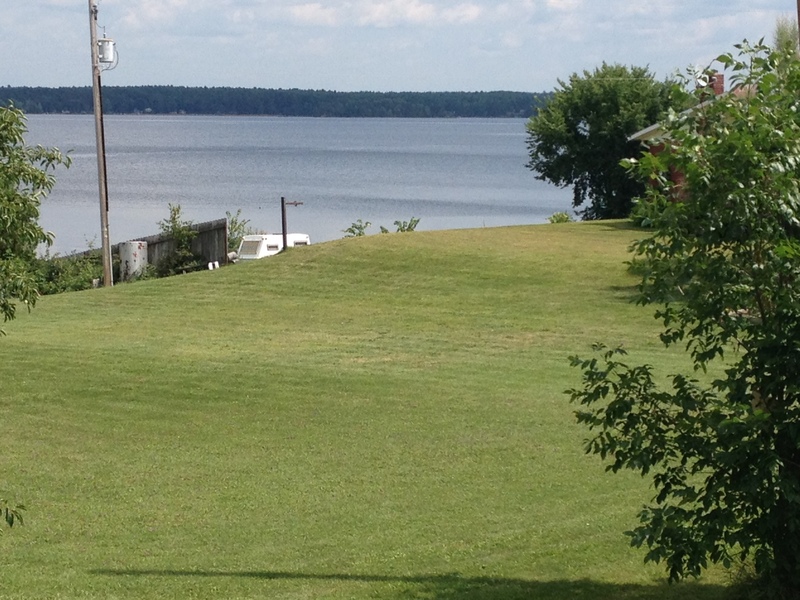 We crossed the Ottawa River and headed east on Hwy 148. Rob led us out of the city! Yes he is back on the road with us part time. He did 16 km. This shot is on the bride leading into Quebec with the Museum of Canadian History in the background. Quebec is a cyclists delight with wide smooth shoulders! Plus the 148 had few trucks and wound through the beautiful Ottawa valley. Sure made for a great ride. 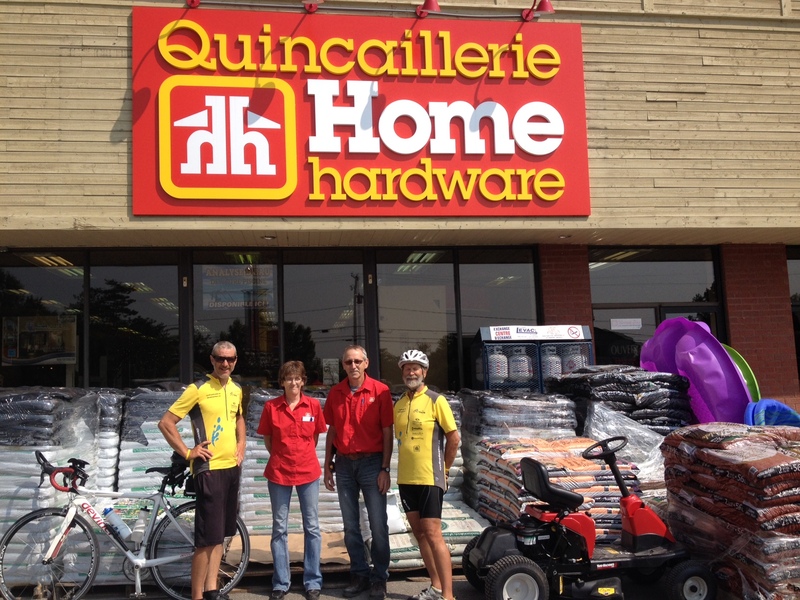 We missed the “Welcome to Quebec” sign but stopped at the Home Hardware in Papineauville and was welcomed to Quebec. 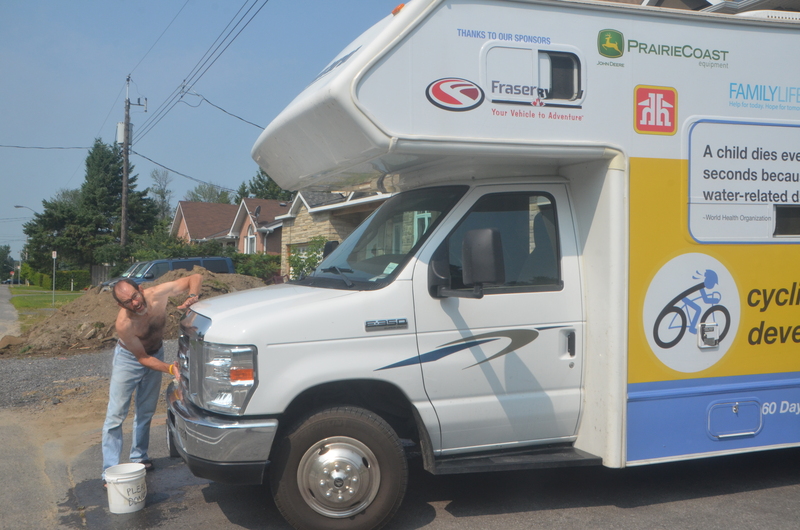 We have stopped at a few Home Hardware stores along the way to thank them for the sponsorship. We also passed Montebello. In the fall our FamilyLife team will be at the Chateau Montebello to host a Weekend Getaway!! What a beautiful place. 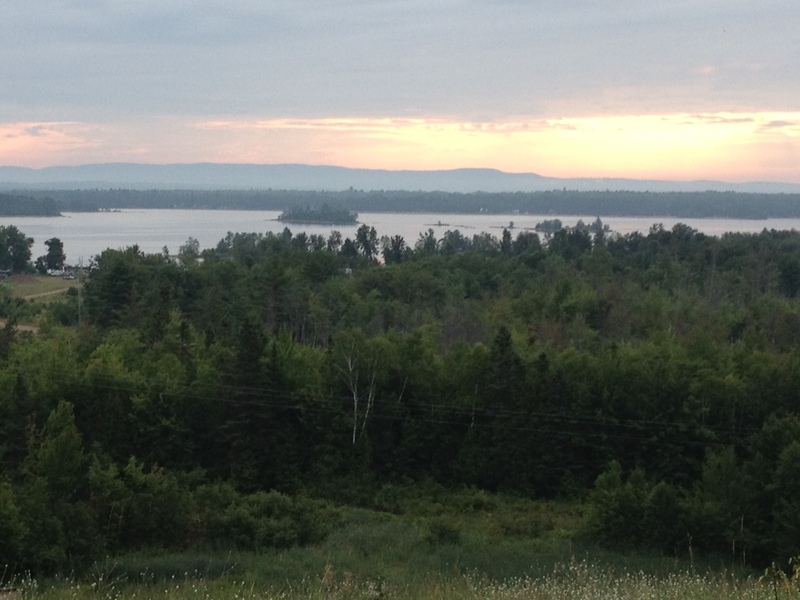 Here a view looking across the Ottawa River into Ontario. The ride was at a good pace, about 27 km/hour till we hit the Metro area. In Montreal there was lots of lights, traffic and we made a wrong turn so did not arrive at the presentation location on time, about 20 minutes late. Dinner was prepared for us and brought to the church by Rob’s daughter. Thank you Lisa! (Center) 12 hour day on the road and no pictures of Montreal because we did not have time!! Two Bar B Qs: Lynn and Bernie hosted one with me and Rob hosted one at his house. Three churches: Alta Vista Baptist, Emmanuel Chinese Alliance and Rob’s home church Église Baptiste Évangélique Le Sentier. Response has been so encouraging! As far as we know we have received about $5500! This amount does not count any donations online from Ottawa presentations. Thank you!! 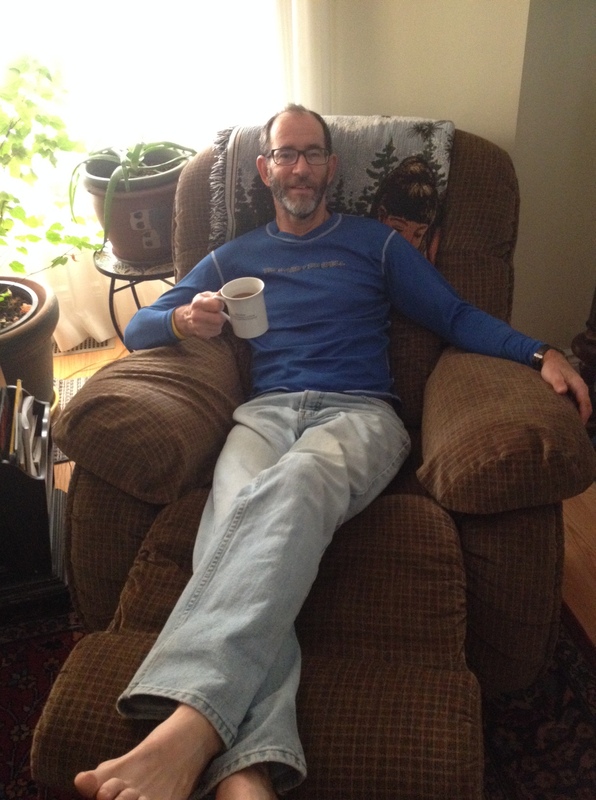 So good to visit with friends and take a rest from cycling for an extra day. 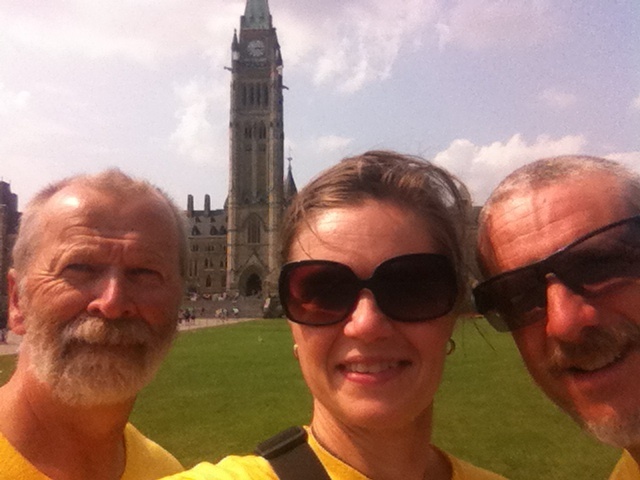 Tomorrow we start at 6:30 am from Parliament Hill and will go to Montreal. Our day started with a great breakfast at our host’s Richard and Helen’s place at 6 am. Thank you Richard and Helen! 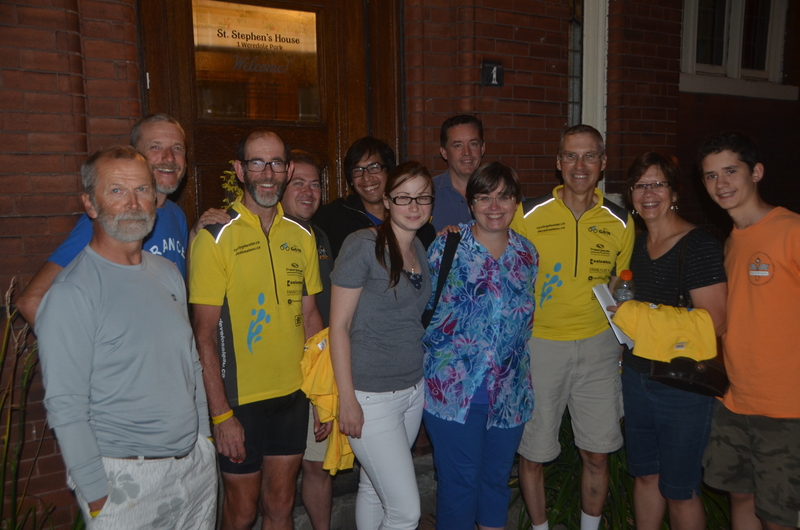 Richard lead us over to the mayor’s office where we enjoyed a spirited visit with the mayor of Petawawa, Bob Sweet. Thank you Mayor Sweet for meeting us at 7:30 am! What a great view of the Ottawa River and sunrise looking into Quebec as we rode to the mayor’s office. 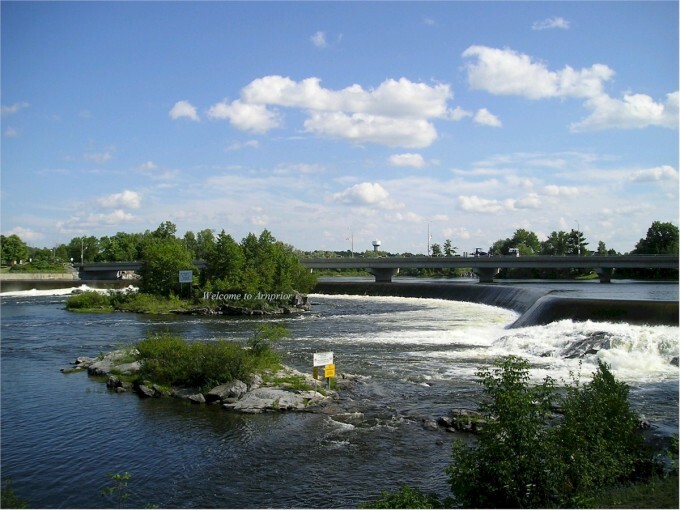 We eventually connected with Riverside Drive which is a beautiful ride along the Ottawa River between Cobden and Arnprior. 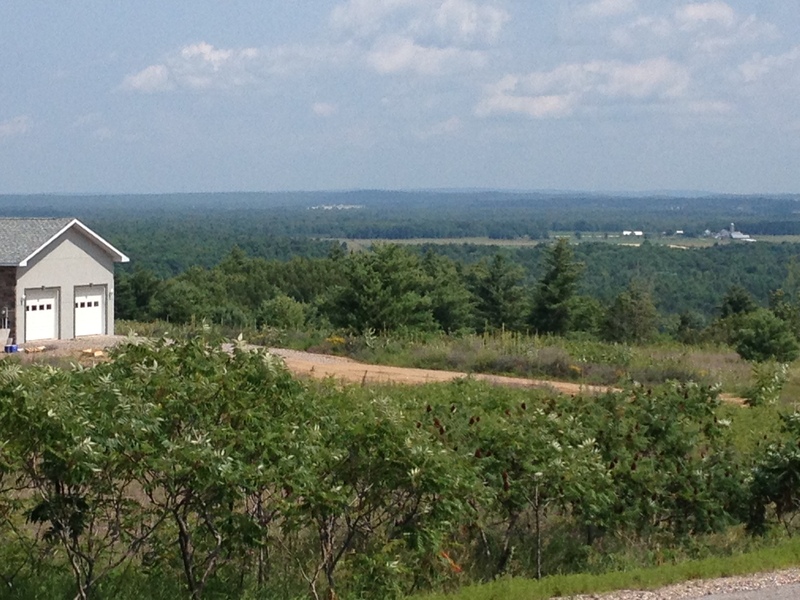 I had forgotten how beautiful the Ottawa valley really is. 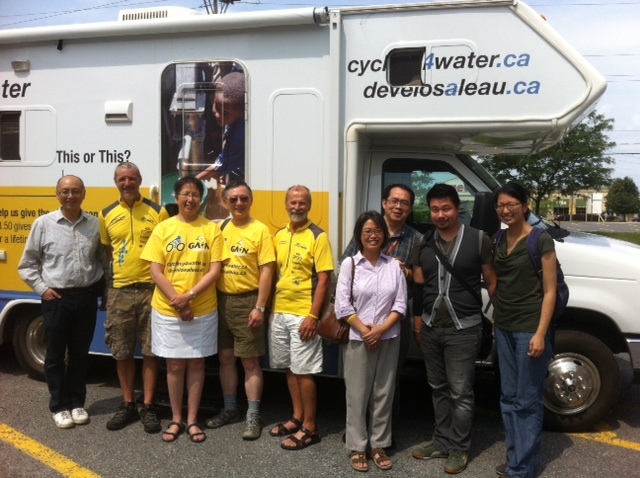 We had a lunch stop and interview with a newspaper in Arnprior. 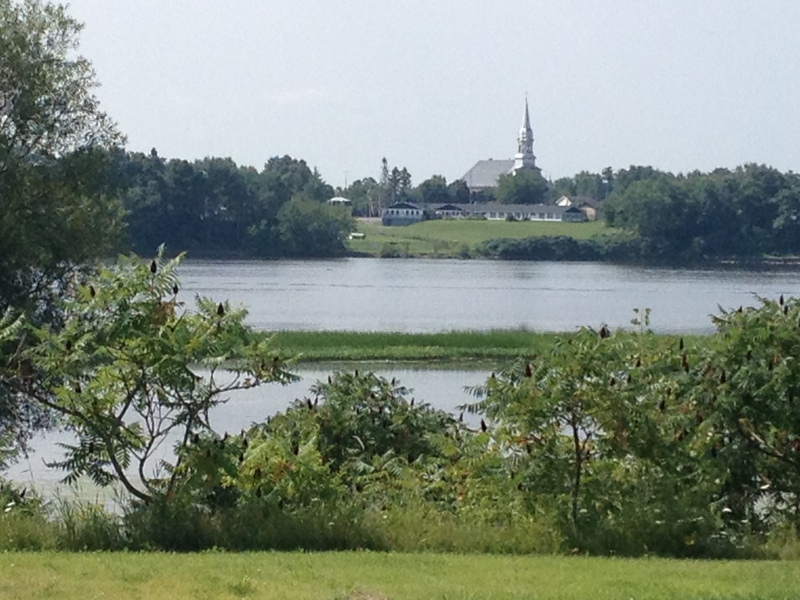 What a beautiful town on the bank of the Ottawa River. A friend just happened to be at a stop light when we cycled past. So Hope joined us for lunch. She also volunteered to pick Jacquie up at the Ottawa airport! What a great friend! Thank you Hope. We left Arnprior a little later than expected. Our ride into Ottawa was complicated. We could not ride on the express way. 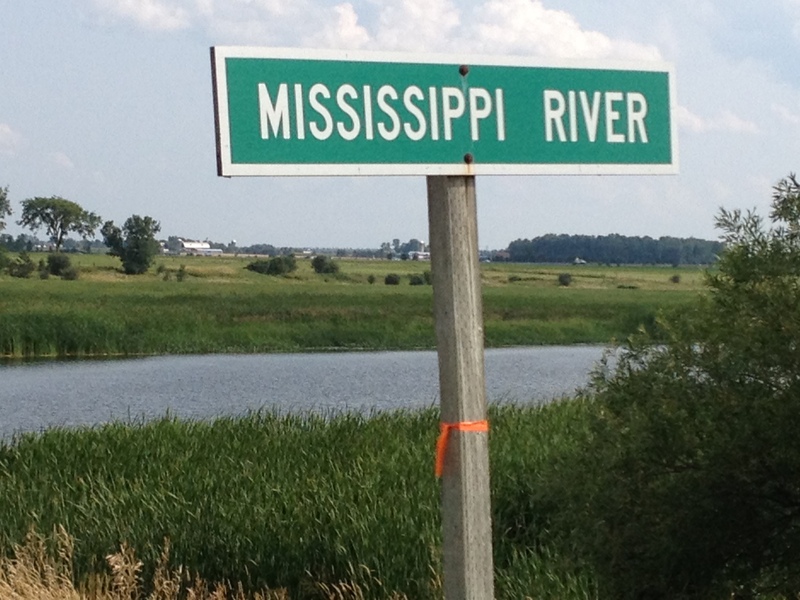 We were sure we made a few wrong turns… Mississippi River…? With all the twists and turns we did not get in till 8:30 pm. That also included another flat tire! It was almost dark when we pulled in. Jacquie had dinner waiting. Sure is nice to have her back on the team after her quick trip back to Abbotsford! My friends Barb and Dave gave us use of their home for the weekend. Thank you Barb and Dave. Rob lives in the Gatineau so will get to spend the weekend with his family. He has started to cycle a bit each day to prepare to rejoin us on cycling, maybe part time this next week.